YES. Even your company needs to do Live Streaming and Video Marketing in 2017! Digital Strategies and Trends Every Marketing Manager Should Consider In 2017. When it comes to digital trends, 2016 was a hot and dynamic year. Instagram rose to fame, Snapchat changed the game, wearable technology started gaining some prominence and big data shaped up the way in which companies gained intelligence. Even more profound developments are to be expected in 2017, necessitating a much more innovative digital marketing approach. Some of the new trends sound as if taken out of a science fiction movie. Augmented reality, artificial intelligence and smart machines have become a real thing. Needless to say, marketers should take these new realities in consideration. What does 2017 have to hold for digital marketers? 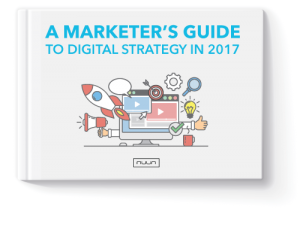 Download A Marketer’s Guide to Digital Strategies in 2017 to learn some of the most prominent strategies and the best ways to make use of each.